At the following time, we will be performing FINAL FANTASY XI maintenance on all Worlds. During this period, FINAL FANTASY XI will be unavailable. - Several in-game issues will be fixed. We ask that players who are scheduled to enter Assault areas, Dynamis or Limbus at the time of the maintenance wait until it is complete before entering. Please note that we cannot replace items that are lost during the maintenance process. Recently, a number of accounts which were confirmed to have violated the the user agreement by using unauthorized third-party software tools were discovered and have been permanently suspended. Since the middle of May, 2006, the development team and the GMs carried out a detailed investigation of this problem, and discovered the existence of a group using illicit methods to produce large amounts of gil that are later sold in the real world (Real Money Trading). We would like to take this opportunity to outline the measures that have been taken to correct this issue. Based on the results of this investigation, more than 250 accounts among those found to be involved in large-scale RMT operations have been terminated. We will continue to monitor accounts suspected of dealing in gil created or obtained in an unfair manner. Thanks to these measures, more than 250 billion gil has been removed from circulation. As has been previously stated, acts of RMT will not be tolerated in FINAL FANTASY XI, and any violations of the user agreement will be dealt with severely. We would like to assure our players that all efforts are being made to ensure a fair playing experience. We hope to have your continuing understanding and cooperation in creating a Vana'diel that everyone can enjoy. The FINAL FANTASY XI Linkshell Community Beta Version! 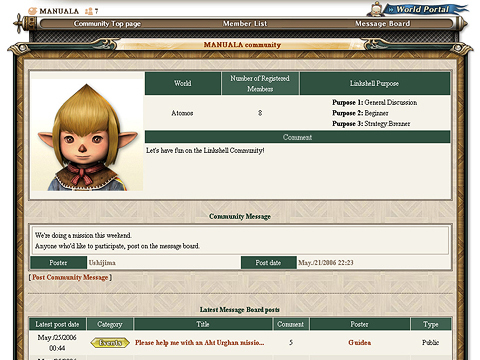 The FINAL FANTASY XI Linkshell Community beta version starts today! Use this page for all your linkshell needs, including everything from recruiting members for missions to posting news on upcoming events. The FINAL FANTASY XI Linkshell Community Beta Version is a new service that will be available to adventurers in the very near future! Now you will be able to communicate with your linkshell members from any location with Internet access! 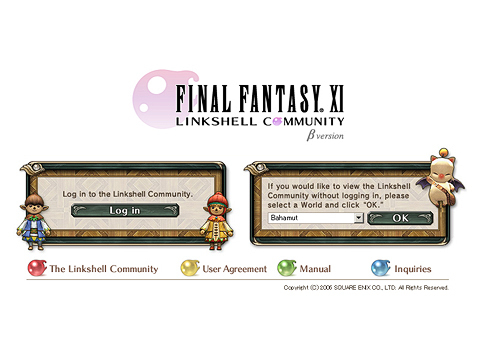 Many tools are provided by the Linkshell Community to support the groups that adventurers have formed within the world of FINAL FANTASY XI. For example, members of a linkshell will have access to an exclusive message board, as well as an up-to-date list of current member information. The Linkshell Community will also provide a linkshell search function and a list of recently formed linkshells for each individual World. The character profiles displayed on the linkshell member lists will be directly connected to in-game data. Character information will be automatically updated at regular intervals, making it unnecessary for players to manually adjust their profiles. In addition to job levels and synthesis skills, other information such as current titles and mission ranks will also be displayed, allowing members to easily recruit for missions and plan events for their linkshell. We will continue to add many more useful functions as the Linkshell Community evolves. The Linkshell Community is an official SQUARE ENIX site;, however, please be cautious when registering your information on other FINAL FANTASY XI-related social networking sites. We hope this new service will help bring a new dimension to your life in Vana'diel! With the upcoming merit point additions, you will be able to improve your character even further with all-new abilities and spells in the existing 15 job categories. 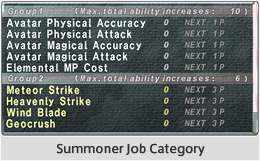 Merit point job categories will also become available for blue mages, corsairs, and puppetmasters. The existing 15 job categories will be improved to allow players the opportunity to further customize their level 75 characters with unique abilities. These improved categories will include 4 to 8 abilities for each job. Depending on the distribution of merit points, it will be possible for players to access multiple new abilities. Check out the upcoming version update news for what's in store. The 15 existing job categories will be divided into subcategories. Group 1 will include conventional abilities, while Group 2 will include the new job abilities, job traits, and spells. You can access Group 2 abilities by spending 1 point on the ability you wish to learn. Additional points spent on the same ability will shorten the recast time or enhance the effect (refer to the help text for each ability to learn the specific bonus). Lowering the number of merit points in an ability to zero will cause it to disappear from your ability list. The Group 1 and Group 2 subcategories have separate totals for the maximum number of possible ability increases. Spending merit points to improve conventional abilities will not affect the acquisition of the new abilities. In the upcoming version update, merit point job categories will be added for the three new jobs introduced in the Treasures of Aht Urhgan expansion disc. These categories will initially contain only the Group 1 subcategory, allowing players to improve the basic abilities for these jobs. In the upcoming version update, new notorious monsters and battlefields will be introduced into the Treasures of Aht Urhgan areas. Also, certain monsters will soon possess an accumulative resistance to magic. Now that everyone seems to be used to the new areas and enemies of the Treasures of Aht Urhgan expansion disc, a number of notorious monsters will be introduced in the next version update. In addition, a new type of high notorious monster (HNM) will be added to the beastman strongholds. Victory will not come easy when facing these new challenges! A number of new battlefields are scheduled for the Treasures of Aht Urhgan areas. You can attempt these battlefields by using Imperial Standing credits. We have adjusted the system so that most players should be able to make an attempt once or twice a week with the Imperial Standing they earn, but players can enter the battlefield every day if they have enough credits. This should make the new battlefields more accessible than orb battles. Currently, a large number of players can team up to overpower the enemy in certain battles by hitting the enemy repeatedly with only elemental magic. This tactic has had an unbalancing effect on the game, and we decided a change was needed. However, altering the effects of powerful magic spells would have a negative effect on black mages and other magic users. Rather than altering magic effects or strengthening monsters, we determined that the adjustment to solve this issue should be as small as possible in scope and affect other gameplay mechanics as little as possible. Therefore, for the next update we have decided to implement an accumulative magic resistance effect for all monsters whose strength reads "impossible to gauge." We have also made several other adjustments to minimize the effect of this change on black mages and other magic users. For example, a party fighting a notorious monster with one to two black mages will probably not notice the difference. However, we have decided to give Bahamut in the quest "The Wyrmking Descends" and Diabolos in the quest "Waking Dreams" a stronger accumulative magic resistance than other notorious monsters. When a monster with accumulative magic resistance is hit by a magic attack, the amount of damage it receives will decrease in accordance with that monster's resistance. At the same time, its resistance will increase. The monster's resistance will increase in accordance with the amount of damage incurred, but each monster has a maximum resistance level. In addition, the monster's resistance will decrease with time if it is not hit by any repeated magic attacks. The Empire has released a list of some of the more prominent villains among the beastmen. Click here to see Aht Urhgan's most wanted! In the upcoming version update, we will increase the importance of strategy during Besieged by introducing new Notorious Monsters as well as various system additions and adjustments. Since its introduction in the Treasures of Aht Urhgan expansion disc, Besieged has become far more popular than the development team ever anticipated. This popularity leads to certain victory with little need for strategy on almost every World, as hundreds of players unite to repel the beastman hordes. With the gradual adjustments that have been implemented, it is now possible to witness the furious battle unfolding within Al Zahbi. However, many players have voiced their desire to participate in a more strategy-based Besieged. With this aim in mind, the following adjustments are planned for the upcoming version update. With the addition of Notorious Monsters that require more than just numbers to defeat, Al Zahbi will find itself under attack from even more powerful beastman armies. The composition of the armies advancing on Al Zahbi will be greatly affected by attacks on the beastman bases. Invading the home ground of the savage beastmen and weakening their forces will become an essential step in the defense of Aht Urhgan's capital. We are aware that the crowding that accompanies the Besieged event overwhelms the processing power of many clients, and prevents a smooth gaming experience. The standard solution to this issue would be to restrict the number of players in the area; however, we feel that hundreds of characters of all levels participating in the same battle is what makes Besieged so popular in the first place. We have no plans to restrict or remove this new feature based on hardware issues. While there is no simple solution, we intend to continue making adjustments that will improve players' enjoyment of Besieged. We are also planning on implementing measures in the next version update that will address issues associated with insufficient memory for certain types of hardware. An interview with the FFXI developers is available at 1up.com, with further info on changes in the next game update; topics include the new zones, chocobo raising, HNM spawns, and more. Quests for Blue Mages, Corsairs, and Puppetmasters! The artifact and limit break quests for the blue mage, corsair, and puppetmaster jobs will be added in the next version update! More details below. The version update was scheduled to take place in mid-July, but has been postponed until late July. The artifact and limit break quests for the blue mage, corsair, and puppetmaster jobs will be added in the next version update. You must have attained a certain level with each job to access its new quests. The artifact quests are continuations of the previously available "An Empty Vessel," "Luck of the Draw," and "No Strings Attached" quests. Like the artifact quests for other jobs, there will be three quests for each new job that the player must complete in order to attain the artifact weapon and two pieces of armor. The other three pieces of artifact armor will not be available in coffers, but instead can be obtained by a new method. The Aht Urhgan areas are for high-level players, and placing coffers in these areas would make the artifact quests significantly more difficult than those for the other jobs. The NPC Maat, famous or even infamous for his part in previous limit break quests, will not be appearing in the new quests due to his lack of expertise in the jobs of the Near East. Instead, the player will have to battle against important figures for each job in order to breach their innate limits. You must complete the three artifact quests for each job before attempting its limit break quest. Click here to read another "Life in Vana'diel" article about chocobo raising. New information on changes and additions to chocobo digging and gardening can also be found below. There will be a number of changes and additions to chocobo digging and gardening in accordance with the introduction of the chocobo raising feature in the next version update. The following changes and additions will be made to chocobo digging to complement the chocobo raising feature. These changes will not affect players' digging skill. 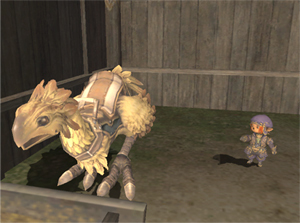 The player's chocobo digging skill will apply to any chocobo they ride or raise. Raising a chocobo in a certain way may result in the acquisition of various abilities. Some of these abilities will enhance the profitability of chocobo digging, such as by increasing the variety of items obtainable via the digging command. -The number of buried items in each area will increase. -Depending on the chocobo, "fatigue" similar to that incurred during fishing will be imposed upon the player after digging for a certain period of time. New seeds will be added in the next version update to allow players to grow their own chocobo feed. Players will be able to grow feed in the same manner as other plants, and will not need to learn any special techniques or purchase any specific tools. In the next version update, we will be adding all new Assault missions that continue in the spirit of providing casual gameplay for busy players. We also plan to adjust the number of Assault Points received for existing missions. In conjunction with the release of the two new mercenary ranks, we will be introducing additional Assault missions. Five new missions will be available at the rank of Lance Corporal, and another five missions at the rank of Corporal. A wider range of options and the necessity for unique strategies will accompany these new missions, so don't let your mercenary skills grow rusty! When participating in an Assault mission with 4 or more people, the penalty on the number of Assault Points earned per person will be decreased. The number of Assault Points earned for each Assault mission will be adjusted to better reflect the level of difficulty. The next version update will bring the release of a new region, new mercenary ranks, and the long-awaited continuation of the Treasures of Aht Urhgan storyline in the form of new missions. 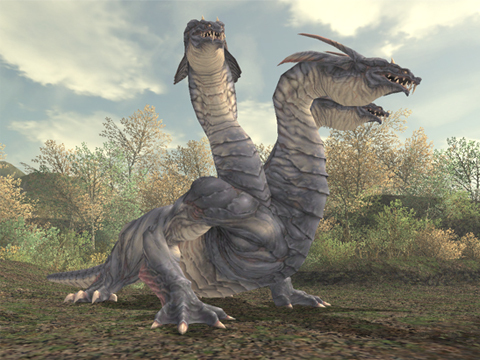 The FINAL FANTASY XI Development Team left difficult battles out of the early Treasures of Aht Urhgan missions in order to allow as many players as possible to enjoy the new content. However, the new missions will be aimed for higher level players, reinforcing the words of Naja Salaheem: "Salaheem's Sentinels only takes the best of the best, the crrream of the crop!" Fierce adversaries and the mysteries of the Aht Urhgan Empire await you! The next version update will introduce two new mercenary ranks and their corresponding rank evaluations. One of the new rank evaluations will be themed after helping out the less experienced. The new region "Ruins of Alzadaal" will be added to the Aradjiah continent. At first, only a part of the area "Alzadaal Undersea Ruins" will be accessible, but other areas will gradually be made available by subsequent version updates. The FINAL FANTASY XI Development Team has put several measures into effect since the release of the Treasures of Aht Urhgan expansion disc to lessen the congestion in Al Zahbi, including adjustments to Besieged and the introduction of auction house fees and bazaar taxes. The upcoming Mog Locker expansion and the introduction of new features in Aht Urhgan are designed to create a more convenient atmosphere for players. While the effects of these changes may not be immediately visible, we believe that these measures will eventually result in less overcrowding of the new towns. The Mog Locker was introduced for the convenience of players exploring the new areas of Aht Urhgan. In order to preserve in-game balance, the Mog Locker was given an initial capacity of 50 items and limited to use in Al Zahbi. Even more players than expected have begun to use this service, so we decided to eliminate some of the restrictions on the Mog Locker during the next version update. Following the next version update, trading Aht Urhgan currency to Fubruhn in Aht Urhgan Whitegate will allow you to increase your Mog Locker capacity to hold 60 items. You will soon be able to use your Mog Locker in your Mog House from anywhere in Vana'diel after the completion of certain free procedures. However, these procedures will slightly shorten the length of a Mog Locker lease, which costs one Imperial bronze piece to renew. In addition, the remaining time on the current lease will be proportionately reduced. Of course, you can always choose to make your Mog Locker usable only in Al Zahbi once again. In accordance with the Mog Locker access expansion, players will also be able to renew their lease for one Imperial bronze piece from a Mog House at any location. The chocobo stables in Al Zahbi will finally open for use in the next version update. Players will be able to rent a chocobo in Al Zahbi and ride out into the Wajaom Woodlands. Please note, however that the NPCs at the chocobo stables may be captured during Besieged, disabling chocobo use until their rescue. Furthermore, additions will be made to the number of special event items that can be stored. In this next installment, we bring you more in-depth information from the world of chocobos! See here for the full details. Version Update Scheduled For July! The first version update after the release of the Treasures of Aht Urhgan expansion disc is scheduled to take place in mid-July. As announced at the FINAL FANTASY XI Fan Festival 2006, players will finally be able to raise their own chocobos! Adjustments to Besieged, new missions and quests, and a variety of other additions and changes are also on the way! More information will be posted on this site as soon as it is made available, so keep checking back for the latest updates! The FINAL FANTASY XI development team has finally addressed everyone�s cries for a system to raise their own personal chocobos. As announced at the FINAL FANTASY XI Fan Festival 2006 in Santa Monica, this new feature will be introduced in the next version update! Chocobos differ based on their color and type�and possibly more. Naming will be handled in the same way that dragoons and puppetmasters select their wyvern or automaton�s name, but there will be more options than ever before! Match up your chocobo with your friend�s chocobo and see what happens. If the match is right, you could end up with a new baby chocobo! Scores of other exciting features are scheduled to be added in the next version update, so keep checking the main site for more information in the next few days! A large slew of new mobs and quests make up the majority of this site update, all part of the new expansion zones. These can be seen in further detail in the April 2006 FFXI Patch Compilation of Info. At the following time we have performed a version update of FINAL FANTASY XI. - During defensive Besieged, beastmen will now focus on reaching their goal, the Astral Plinth, than actively involving into battles. - An issue wherein players may be able to receive experience points and Imperial Standings which has exeeded the cap has been fixed. - Addressed an issue where internal test messages would display on the screen during Besieged. At the following time, a FINAL FANTASY XI update was performed on all Worlds. An issue was fixed wherein the game may freeze if players check their delivery boxes during a defensive Besieged. At the following time, we performed FINAL FANTASY XI version update on all Worlds. - Chances of NPCs within Al Zahbi being captured during Besieged have been adjusted. - The Imperial defense recovery rate based on the amount contributed to the NPC "Gajaad" within Al Zahbi has been modified. At the following time, we have performed FINAL FANTASY XI maintenance on all Worlds. - Bazaar custom calculation for Aht Urhgan Whitegate has ben applied to the Al Zahbi area. - The Home point within Al Zahbi has been removed. - Beastmen level during besieged has been adjusted. - Upon entering level limited areas o battle fields. - Received monsters' attacks with dispel effect. - Fixed an issue wherein "Empress Band" or "Chariot Band" bonuses would wear off without reaching the maximum bonus limit when under Sanction effect. *The client software has also been updated at this time. The version update process will automatically begin upon login after the time stated below. Please follow the instructions that appear on your screen. - After the event scene for the beginning of a besieged is over, all participants will be automatically relocated to different positions within Al Zahbi. - Fixed an issue wherein players were unable to obtain their "runic portal use permits" upon consuming 200 Imperial Standings. - Fixed in game message regarding Corsair's ability "Phantom Roll." - ";" would not function upon key assigning. - And issue where the software keyboard would not function properly after the controller's power supply has been switch off. -An issue where a disbanded alliance would remain as not disbanded will be fixed. - An issue where a map purchased with Imperial Standing could be purchased again will be fixed. - Monster "Sicklemoon Jagil" will be addressed to only respond to sound instead of sight. - An issue where players may be unable to obtain key item for the "Vanishing Act" quest while harvesting will be fixed. - Guild NPC has been giving out the incorrect recipe for synthesizing "Jaridah Salvars." This will be addressed. As of May 16, FINAL FANTASY XI will celebrate four years of service! In gratitude for everything adventurers have done for Vana'diel, the moogles are holding another Adventurer Appreciation Campaign. You can see reports on your battle history, and have the chance to receive some great items! Join your friends and bask in the appreciation of Vana'diel's citizens! Even the heads of state agree that the safety of our nations, the security of our cities, and the peaceful lives of our citizens are all made possible through the tireless efforts of Vana'diel's adventurers. It is time for adventurers to reap the rewards of their service! Once again, the nations of San d'Oria, Bastok, and Windurst will become the stage for the "Adventurer Appreciation Campaign." During the planned events, adventurers will receive gifts of gratitude from the townspeople and hear detailed reports of their conquests in battle (based on data secretly collected by the M.H.M.U.). "Adventurers great and small, you have our heartfelt gratitude! Your dedication and courage have made Vana'diel the wonderful place it is today!" This event is scheduled to begin on May 11 at 17:00 and end on May 31 at 0:00 (PDT). A slew of additions here, providing data from the new Treasures of Aht Urhgan expansion. Expanded details on much of this info can be found in the April 2006 FFXI Patch Compilation of Info. And so, the moogles are once again asking for help from the "courageous, illustrious, and awe-inspiring adventurers of Vana'diel" (in their own pleading words). Will you answer their call? Vana'diel is once again gearing up for the Feast of Swords, a Far Eastern festival in which town residents celebrate their sons' healthy growth by raising banners decorated with enormous fish, and dressing the towns' male youth in armor for mock fights. Many citizens of Vana'diel still remember the chaos of the last Feast of Swords, when the priceless armor the Mog House Management Union (M.H.M.U.) borrowed from the Far East was stolen. Thanks to the efforts of the adventurers, the armor ended up with back its Far Eastern owners just in time, but the near diplomatic near-disaster had everyone in a cold sweat for days. Many seasons have passed since the international incident, and everyone expected the M.H.M.U. to have abandoned all hopes for the Feast of Swords...until now. Rumor has it that the M.H.M.U. was determined this time to create the perfect festival this time, and persisted in its pleas until the Far East finally gave in--and the Genji family lent them their legendary armor once more. The moogles busily scurried around to make the preparations, and everything seemed to be in order...or so they thought. The ship was immediately set upon by Near Eastern pirates after docking at the Mighoya Dunes on the continent of Mindartia. The pirates' leader, Barracuda Myu, had followed the vessel all the way from the Cyan Deep, believing that it carried powerful Aht Urhgan weapons. Fortunately (or unfortunately?) for the Far Eastern crew, the Federal Forces of Windurst appeared to save the day. However, when Myu's gang was surrounded and left with nowhere to run, they turned to drastic measures. Upon learning that the ship actually carried sets of priceless armor, they devised a plan to escape wearing the cargo. They reasoned that surely no one would risk harming a national treasure. And so, the moogles call on the adventurers to save them from yet another prickly situation. The master carpenter Kupelcian has once again begun production of a special weapon designed to inflict no scratches or dents on the treasure. Take up the wooden katana once more and save the invaluable armor from the pirates! The dignity of the M.H.M.U.--no, of the Middle Lands--can only be preserved by your actions! -Speak to an event moogle in one of the three main nations to receive a lotus katana. -Once you have a wooden katana or a lotus katana, speak to a nomad moogle to participate in the event. -While participating in the event, you will be restricted to level 1, but your movement speed will increase. Please note that any equipment that you are wearing that is for level 2 or higher will automatically be removed. -You cannot attack or be attacked by regular monsters during the event. This event is scheduled to begin on April 27 at 17:00 and end on May 11 at 0:00 (PDT). More information regarding the MPK measures mentioned in the recent version update news is now available. Click here for details. At the following time, we have performed FINAL FANTASY XI version update. - Unable to use auto translation function using the "Pause" key. - "Mog Locker" item sort information was not saved properly. - Several items were unable to be sorted correctly. - Unable to filter countdown message while logging out. - An issue wherein the wide scan would not function properly with Blue Mage, Corsair or Puppetmaster set as support job. - An issue with incorrect automaton status display. - Some Shadow (fomor) type monsters which have lost their target would not disappear when they are out of their radius of activity. - During Besieged, level and speed of beastman army marching towards Al Zahbi have been modified. At the following time, we will be performing FINAL FANTASY XI version update. - An issue where characters may become stuck at the pier of Al Zahbi or Nashmau. - Icons within auction houses are not displayed correctly. - An issue where Aht Urhgan quest and mission Current and Complete lists displayed for those who do not have "The Treasure of Aht Urhgan" installed. - An issue where only the party leader was allowed to enter assault areas. - Game freeze issue would occur during the "Bait and Switch" quest under certain circumstances. - Besieged stronghold military decrease rate has been adjusted. - Changed the increase rate of the checkpoint forces. - Checkpoint forces will not decrease even if Archaic Mirror in the beastmen checkpoint is destroyed. But it will stop the increase of the checkpoint forces. - Increased the number of passengers on the ship heading out from Aht Urhgan Whitegate. - Bazaar items will be taxed in Aht Urhgan Whitegate. The tax rate is the same as in Jeuno region. - An issue where Nashmau can be set as a home point after changing the job has been addressed. - Changed the sale price of black ghost.